Young South Australians aged 15 to 24 years are encouraged to apply now to be a part of this year's YMCA SA Youth Parliament program. Youth Parliament is coordinated by the YMCA of South Australia, and supported by the State Government through the Department for Communities and Social Inclusion. Now in its 22nd year, the initiative provides a unique forum for young people to have their say and learn about South Australia's parliamentary system. More than 85 young people from across metropolitan and regional South Australia participate in the program each year, both as participants and program volunteers. Bills passed by the Youth Parliament are formally presented to the Minister for Youth for the Government's consideration. Every year a Youth Governor is identified to play a key role in Youth Parliament. This year’s Youth Governor is Ms Appurva Raaj, aged 20, from Adelaide, who is studying Law and International Studies. Scholarships are available to all regional participants to cover travel and accommodation costs to and from Adelaide, for the training weekend in May and the residential week in July. The number of regional participants in the program has more than doubled since the scholarship was introduced. In 2016, 21 of the 71 participants were from regional South Australia. 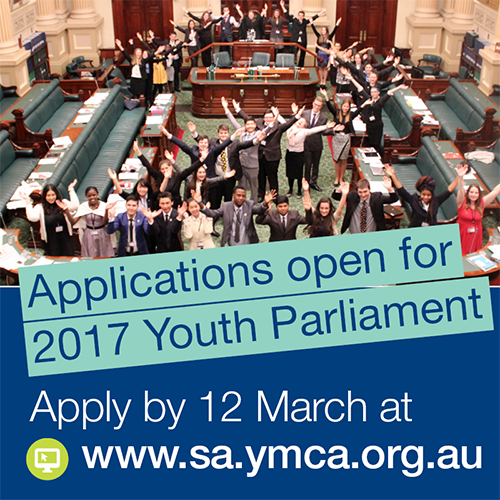 To apply or find out more information about the Youth Parliament program and regional scholarships, visit YMCA SA. Applications close on 12 March 2017.